How to take charge of your OPD expenses? To handle these expenses, one can opt for an insurance cover. Such plans can also help you achieve your tax savings objective. Not only is the premium paid eligible for a deduction, but also any claim mounted will also not attract tax. Any person needs to anticipate a once in a while visit to the doctor and along with it some outpatient costs. These expenses are often in the form of consultation fees, dental and optical fees amongst others. Here’s how you can take charge of your outpatient expenses. To handle these expenses, one can opt for an insurance cover. Such plans can also help you achieve your tax savings objective. Not only is the premium paid eligible for a deduction, but also any claim mounted will also not attract tax. These plans best suit those who especially incur considerable pharmacy bills. For example parents with young children prone to illnesses. However, health insurance experts advise that, when you weigh out-patient expenses against the core purpose of health insurance, i.e. to alleviate risks arising from colossal expenses like hospitalization bills, outpatient expenditure is not a terrible loss thus covering the same through insurance same is not a very level headed decision. You can choose to meet these expenses out of pocket, but this alternative is not a financially sound practice. You still need to budget and factor in the possibility of such expenses month on month. However, since these expenses tend to creep in unexpectedly you may have insufficient cash on hand at the time causing inconveniences such as short-term borrowing from relatives and friends. It is conservatively estimated that the rate of inflation of medical care costs stands at 15-18 percent, per annum. Financial planners advise that rather than pay expensively for the insurance premium or risk making emergency borrowing, prudent financial planners would create a healthcare fund. This is particularly practical and advantageous for those whose medical history disqualifies them from accessing a health insurance policy. 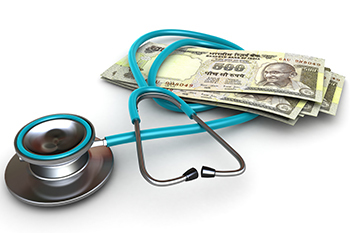 To build a health corpus, focus on low risk but liquid instruments such as debt mutual funds or fixed deposits. You can also contemplate investing in equity funds through the systematic investment plan (SIP). The main disadvantage on this is it has negative tax implications in the event that you make premature redemptions. To be more precise, any short-term capital gains made on redemption prior to reaching three years is added to your income and taxed according to your respective slab rate. However, it is widely argued the higher returns earned by through mutual fund investments can easily compensate for this limitation. The biggest advantage of a self-created corpus is that you maintain the freedom to draw from the fund for any kind of emergency that you may encounter and not just medical. The best option while taking charge of your OPD expenditure is determined by you, carefully consider your alternatives and position yourself to make the most rewarding choice.